We offer a variety of different takes on the iconic Star-Spangled Banner, which enables businesses, private individuals, and other organizations to boldly display their patriotism. 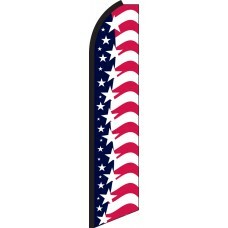 Our patriotic American Swooper Flags are our best-selling category of feather flags. 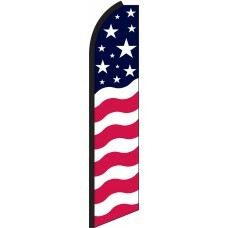 These flags feature detailed graphics and vibrant printing to ensuring that they will attract maximum attention. whether they are used as an advertisement or simply to demonstrate American-pride. 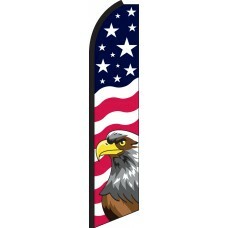 Patriotic feather flags can be used to decorate in a range of different applications including: business exteriors, corporate events, sporting events, marathons, festivals, and parades. The most common use is for businesses such as car dealerships, retail stores, and apartment complexes to decorate in front of their location which helps draw customers in and makes the company stand out from the crowd. 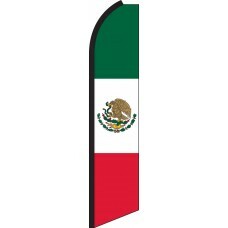 We also offer Swooper Flags that pay homage to the designs of the Canadian and Mexican flags. 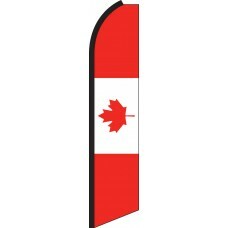 Canadian feather flags are primarily used by companies in Canada to demonstrate their national pride, while the Mexican design is used throughout the United States in areas where there are large populations of Mexican immigrants as well as in Mexico. 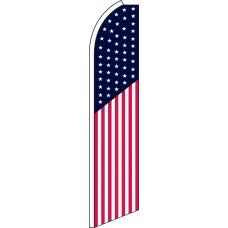 These flags are used to demonstrate national pride and heritage and to attract customers from those nations.